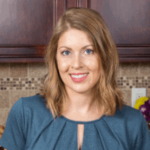 Published: Feb 8, 2018 · Modified: Apr 11, 2019 · By Jen Sobjack · This post may contain affiliate links. 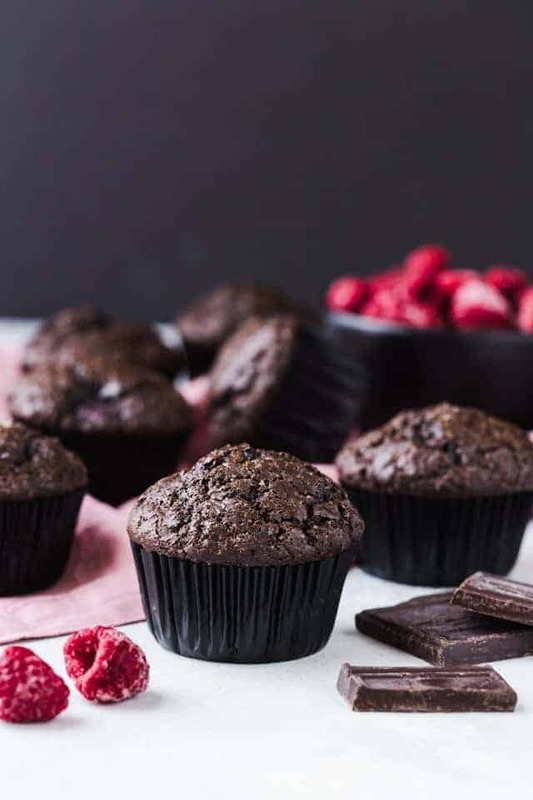 Double Chocolate Muffins with Raspberries will become your favorite breakfast option. 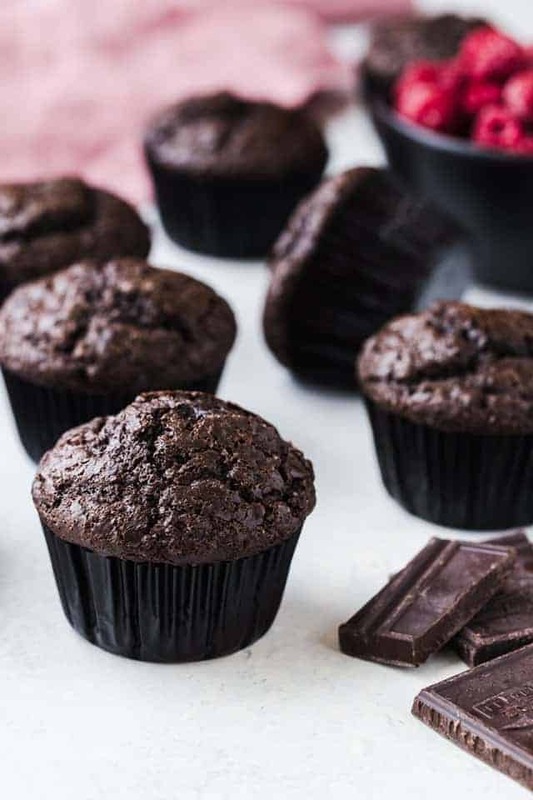 Each muffin is moist, full of chocolate flavor, and speckled with juicy raspberries and dark chocolate chunks. To celebrate Thursday, because it’s one day closer to Friday, we’re venturing into double chocolate heaven. Double chocolate with raspberries, in fact. It doesn’t get much better than this when it comes to rich, decadent muffin flavors. 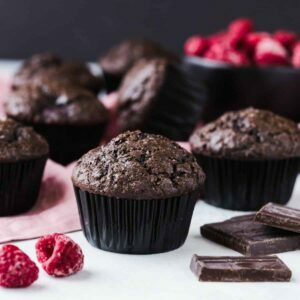 These double chocolate muffins with raspberries are certainly a great way to celebrate Valentine’s Day. 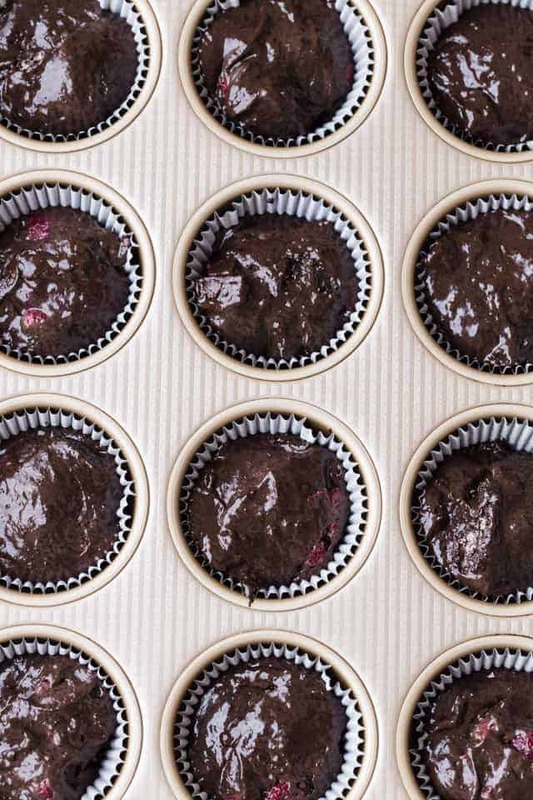 Each muffin is loaded with dark cocoa, melty bits of chocolate, and tart raspberries. You could almost opt to enjoy these muffins for dessert! This is truly a super easy muffin recipe that uses the muffin method for mixing the batter. Remember, I talked about this in my ultimate muffin guide. You need two bowls. One to mix the dry ingredients and one to mix the wet ingredients. Then you simply combine the two and fold in bits of chopped chocolate and frozen raspberries. You don’t even need a mixer for this. A sturdy whisk will do the trick! For optimal moisture and tender texture, I went with egg, oil, sour cream, and milk. This gave the muffins a cake-like crumb. They came out super rich and very soft. For the dry ingredients, you’ll need flour, Hershey’s special dark cocoa powder, sugar, and baking soda. I like the dark cocoa because it gives the muffins a more complex chocolate flavor and adds to the deep chocolate color. Once the wet and dry ingredients have been combined, fold in chopped chocolate and frozen raspberries. I used frozen raspberries because I find that they are easier to stir into the batter. Fresh raspberries are too delicate and will become smooshed as you try to mix them in. You can use any type of chocolate you prefer. I’ve made the muffins with semisweet and dark chocolate. Both are exquisite. Chop it fairly coarse so you get decent sized pockets of melty chocolate with each bite of muffin. Just look at this gorgeous dark chocolate batter. Just wait until you can sink your teeth into one of these fresh from the oven! 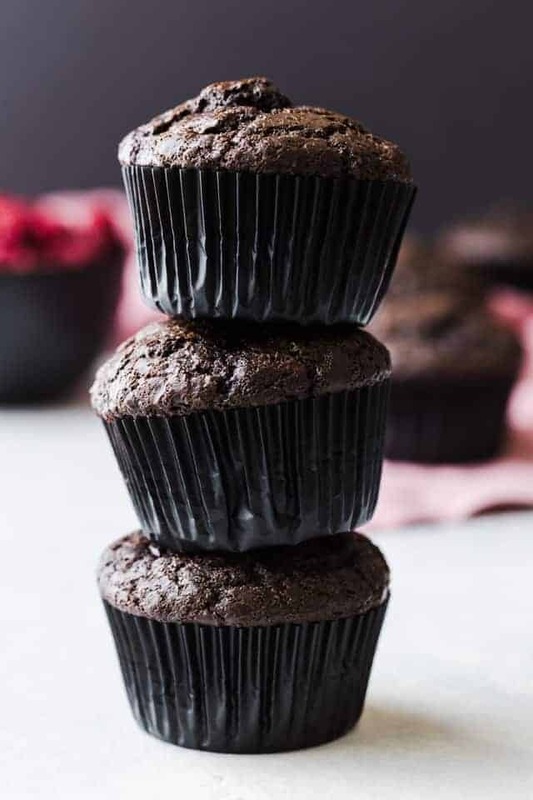 These double chocolate muffins bake up with lovely crackle muffin tops. Although they’re not quite as tall as some of my other muffins, they are just as delicious, if not better. This is one muffin that will pair especially well with a cup of coffee in the morning. Take care not to over mix the batter. Mix until the dry ingredients are barely incorporated, then fold in the chopped chocolate and raspberries. It’s perfectly fine to have some streaks of dry flour in the batter. This will give you a tender muffin. 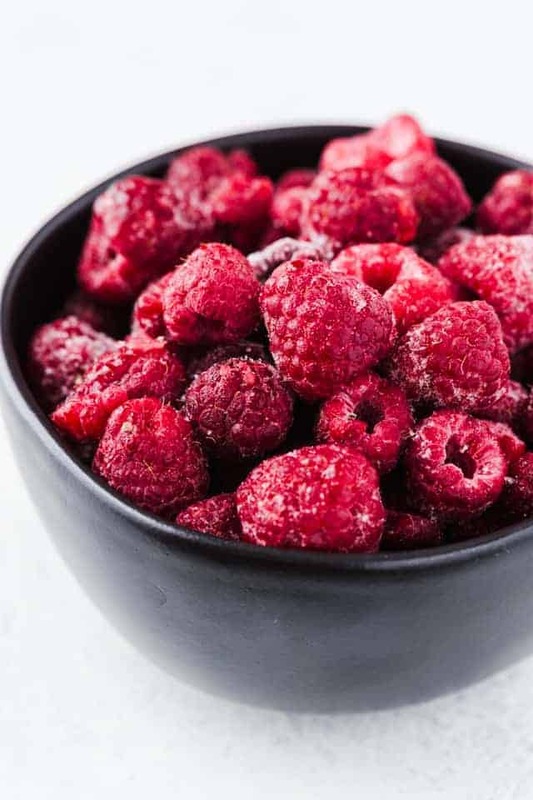 Be sure to use frozen raspberries. Fresh raspberries are too delicate to mix in without smashing them. Don’t have sour cream? No problem, use plain yogurt in its place. Use any type of chopped chocolate you prefer as a mix-in. Semisweet and dark chocolate are my favorites. Don’t like raspberries? Again, no problem! Simply leave them out. You can add additional chopped chocolate or chips instead. Preheat the oven to 400ºF. 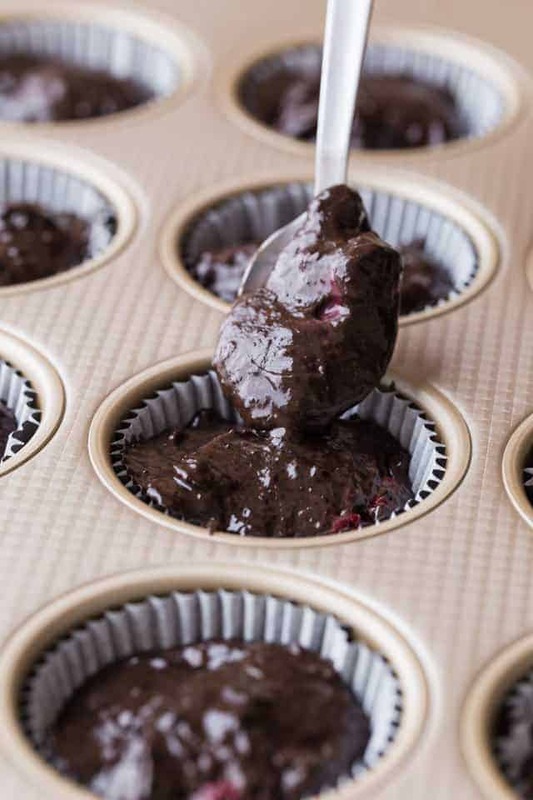 Spray a 12-cup muffin pan with non-stick spray or line with paper liners. Set aside. In a separate bowl combine the flour, sugar, cocoa powder, baking soda, and salt. Stir with a whisk. Make a well in the center of the flour mixture. In a separate bowl, combine the sour cream, milk, oil, egg, and vanilla. Stir with a whisk to combine. Pour the sour cream mixture into the flour mixture. Stir with a silicone spatula just until the dry ingredients are just barely incorporated. Add in the chopped chocolate and raspberries. Continue to stir until just a few streaks of dry flour remain visible. Divide the batter evenly between the prepared muffin cups. Bake for 18-20 minutes or until a toothpick inserted into the center comes out clean. Cool the muffins in the pan for 5 minutes then transfer them to a wire rack to cool completely. They can also be enjoyed warm! Muffins will keep stored in the fridge for up to 1 week. Muffins can be frozen for up to 3 months. Thaw in the refrigerator overnight. If desired, bring to room temperature or warm in the microwave. Don’t like raspberries? Simply leave them out and add additional chopped chocolate or chips instead.